During my early TV career in the 70’s, I lived in Philadelphia and got to know the Germantown area very well. Recently, I stumbled upon the website for the Germantown Friends School Craft Fair which took place this past February/March. I thought the level of artists of who participated in the event was spectacular, including Karen Klinefelter of Klinefelter Studio in Burlington, Vermont. I found the original rusted metal mesh piece in the road while I was running one day. I loved it for what it was and was taking it home to frame. Then I wondered what it might look like cast in Sterling or 18k. Once I made the mold and cast the first pieces, I was in love! The rust on the original piece, provided a texture to the mold that when cast, left a beautiful finish in both the silver and gold. I’ve used the mesh in many different designs. The tricky part is not to disturb the raw casting while I add other elements , such as high polished pieces or little diamonds. You have said that you also get inspiration from Third World countries. What have you found in these places that affect your style? Most of my third world travel has been in Asia. Nepal is my favorite place on earth. I’ve also traveled in India, Thailand, Haiti and Chile. Most of the cultures I’ve experienced have ancient aesthetics that are rich in color and pattern. They tend to be very busy..and probably somewhat the antithesis of my minimalist designs. However, the lifestyles of the people who live in the more rural villages in these countries are very minimal by necessity. They live very modestly and sparsely. Most of them have very little and yet they have faith and value for what they do have. They inspire my “less is more” design sense. I think you are as much a story teller as a jewelry designer…you seem to have mastered enhancing the appeal of your pieces with the story behind them. How important is that to how customers see your pieces? I think people enjoy hearing stories about the inspiration for pieces they are interested in. I know I enjoy telling them. It’s a way for me to connect with someone who may end up owning a piece of jewelry that I created. I like selling at retail shows for that reason. I like to meet my customers…..make sure my jewelry is going to a good home. I find when I tell the stories, I get just as many great touching stories back from my customers. I enjoy that connection and getting glimpses into my customers lives just as much as selling them a piece of jewelry. On your website, you say you hope to “make every one’s favorite pair of earrings”…tell us about that. I myself am not a big jewelry person. Life in Vermont is very casual to say the least. Out of habit, I often wear the same jewelry day after day. I also have many friends who say the same thing. They find pieces they like and stick with them. It gives me great pleasure when I hear that earrings that someone bought from me are their favorite pair! I relate to that and it’s a great complement! I have a degree in Psychology and years ago worked as a counselor for women with eating disorders. The common denominator among my clients was a lack of self esteem and a disconnect from one’s physical self. I was making jewelry part time then and decided to create a talisman to remind women of their innate strength and wisdom. A very talented friend of mine actually carved the wax. It was originally commitment rings for a couple. But I saw great potential as a ring to remind ourselves that we are whole and complete as we are. 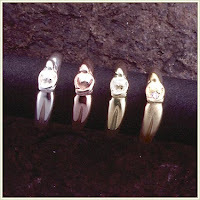 It has since been a source of incredible strength and joy to me as the rings have a life of their own. I think one day I should collect the wonderful, courageous, and sometimes heartbreaking stories I have heard about women who purchase the rings for themselves , friends,and loved ones. The Circle of the Spirit rings have supported women through divorce, cancer, and grief of many kinds, they have also celebrated babies, graduations and coming of age transitions. I love that the circle has widened to the point where I don’t know half of the stories…….they are happening as we speak. You work in a studio environment around other creative people….this is an unusual arrangement since jewelry making is so solitary for many….what are the advantages of being around other people as you work? I have the best of both worlds. I have my own studio space within another business, which happens to be a custom lighting and metalwork shop. They are not only creative fun people, they also work with metal. Their pieces are of a very different scale, but we share ideas and I often look at their work for inspiration if I find myself “stuck” in a design process. The day to day interaction with these folks who are now friends is also nurturing. I think it’s very valuable experience to work for someone else in the field for awhile. It’s a wonderful business, but there are many different ways to market your work. It’s good to know that, and to have some exposure to that. My business plan is constantly evolving and I think that I can maintain my faith during tough times because I know there are so many avenues to explore. And also be mindful that you need to be connected enough to your work to remain true to your design sense, and separate enough from it to not take it personally when something you’ve tried business wise isn’t working. You need to be flexible. Karen’s work can be found at retail craft shows (check her website for the schedule) and the local Burlington, VT Artist Market this summer. She also has pieces at the Village Green Gallery in Weston VT, and Grannis Gallery in Burlington, VT. I love Karen’s work! There is something simple yet so radiant about her pieces that they stay with you long after the images are gone. I also love that Karen seems to have a balanced life, finding joy in her life and creations. I wish her tremendous success and further happiness! Previous post: Vote now in the Couture Town&Country “Primary” Design Awards!